The Pecan Tree Is Gone! Remember the ugly leaning pecan tree in my front yard? 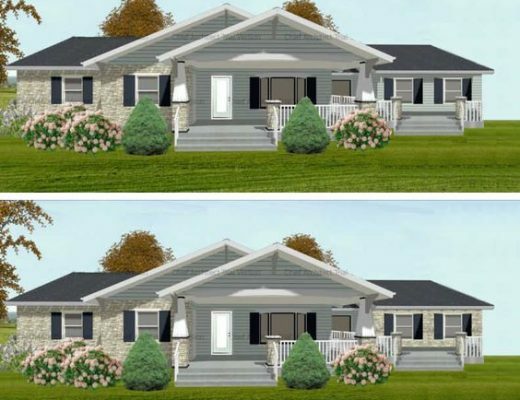 If you’re standing in the street looking at my house, I’m talking about the one on the right side of the front yard. Here it is in the picture I took right after we bought the house in 2013. I’m happy to report that it’s gone! 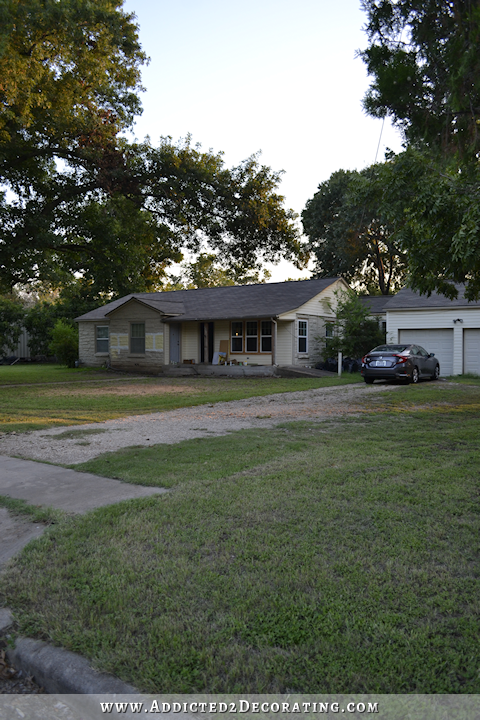 That pecan tree is finally gone, and my yard looks so open and airy now! But I’ll take what I can get when I can get it. 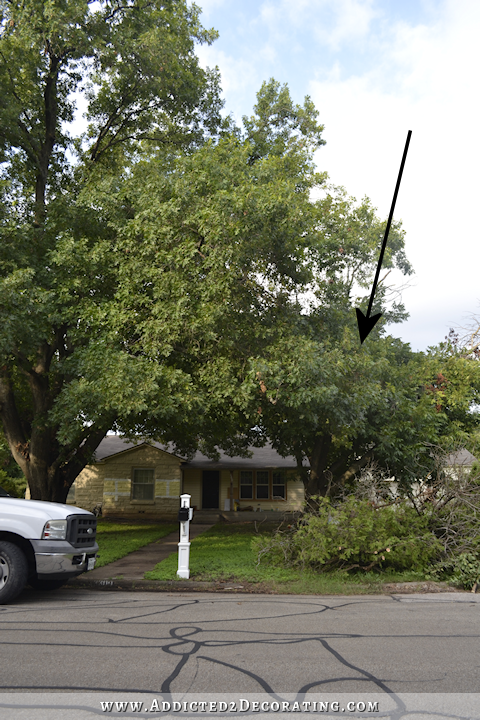 And seeing that I’ve hated that sad leaning pecan tree since the first time I saw it, and the opportunity presented itself to get it cut down last week, I jumped at the chance. When we got our trees trimmed that first year we were here, the tree guy told me that the pecan wouldn’t be with us much longer anyway because it was dying from the top down and was no longer producing pecans. Honestly, I was happy to hear that. I would have felt guilty cutting down a perfectly healthy pecan tree that was still producing pecans. But that first year, we couldn’t afford to have it removed completely, so we just had it trimmed along with the other trees. And over the last two years, the limbs that were still alive grew like weeds, completely covering that side of the yard and extending over the roof. We weren’t really planning on having it cut down right now. In fact, just a couple of weeks ago when the concrete guys were here working in the breakfast room, one of those guys told me that he was actually just helping his friends with the concrete, but his main line of work was trimming trees, lawn care, etc. So I asked him how much he would charge to cut down the pecan tree, and he gave me a price of $1500. I decided that it could wait until after the breakfast room was done. But then we had squirrels in our attic…again. Or so I thought. I could hear them running around up there in the evenings, and it was driving me crazy, so I called out the critter guy last week to come and get them out of my attic and close up their entry points. Well, he came, he spent about an hour inspecting inside the attic and all around the outside of the house, and then told me that he couldn’t see any way that squirrels were getting into our attic. He said that the attic was still completely sealed up with the new spray foam insulation, and he didn’t see any points where they had chewed through. And he also didn’t see any entry points on the outside of the house. Plus, he said that since we don’t have fluffy batt or blow-in insulation for them to nest in, they have no incentive to even want to get into our attic. He said what he thought was happening was that our trees had gotten so overgrown since having them trimmed two years ago, to the point that we actually had about three limbs lying directly on the roof (oops! I hadn’t noticed! ), and those limbs were creating easy access points onto the top of the roof. So the top of our roof had basically become a squirrel superhighway. He told me to get the trees trimmed away from the roof and see if that solved the noise issue. If I still heard them after that, he would come back and do another inspection and move on to Plan B. That was last Tuesday, so I added “find a tree trimmer” to my list of things to accomplish by the end of the week. Well, on Wednesday, my neighbor randomly showed up on my doorstep with a friend of his who just happened to be a tree guy! So we walked around the house, and I pointed out everything that the critter guy told me needed to be done. Since I had already gotten an estimate of $1500 the week before for cutting down the pecan tree, I just asked him to give me a quote for trimming it. 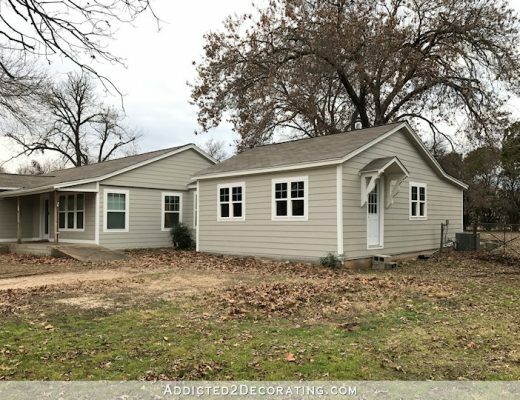 So he was going to cut down one medium-sized tree in the back yard, two medium-sized trees on the side of the garage, and then trim both large pecans and the huge oak in the front yard. His price for all of that? $350. I nearly fell over when he gave me that price! So I went ahead and asked him what it would cost to just cut the pecan tree down completely, plus do all of the other work we had talked about. $850. Eight hundred fifty dollars!!! Umm….SOLD! You can really see in this picture how the limbs had become overgrown and sprawled out to the point that the house was barely visible behind it. And of course, the dead limbs looked awful. 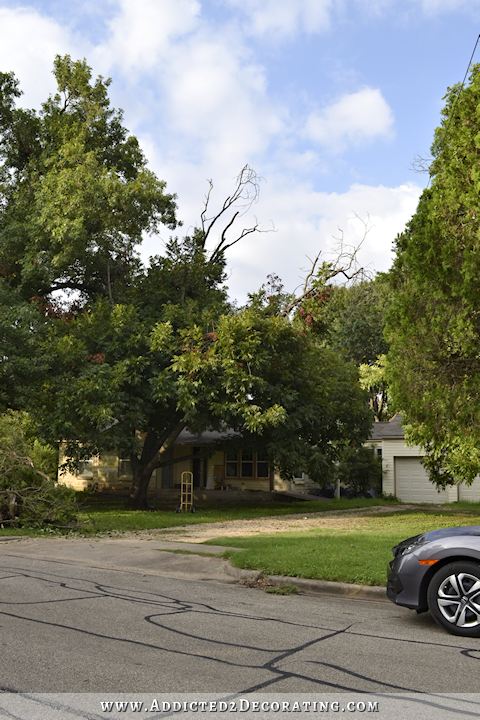 They made quick work of cutting the pecan tree down, and even with the fallen branches covering the yard, it looked so much better. I loved how open it looked, and especially liked that sunlight could actually reach part of the yard now. And now that the whole thing is gone, the house is actually visible from the street again! And one day, that will actually be a good thing. 🙂 Right now, though, it might just provide the necessary incentive to get out the pressure washer and see if I can get those paint samples off of the stone since I’ve decided to hold off on painting. So for now, it’s just a small improvement, but one that I’ve looked forward to from Day 1 in this house. It’ll be even more exciting when we finally get to the front porch remodel and I can actually do some pretty landscaping now that at least part of the yard can get some sun. 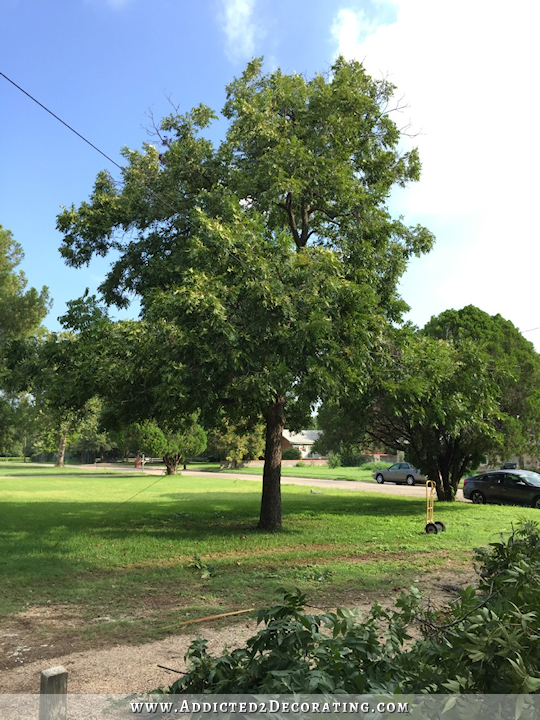 They also trimmed up the other pecan tree, and it looks so nice now. That pecan tree actually produces a huge amount of pecans each year. Last year, I never got a chance to go out and gather pecans, so the squirrels got them. I plan to gather as many as I can this year, because those pecans are big and delicious! It’s silly to let free pecans go to waste. Lisa, I’m in upstate NY too and you got an incredible bargain. Lisa, you sure did!!! We had three huge trees taken down for 1500.00 and that was the lowest bid we received. 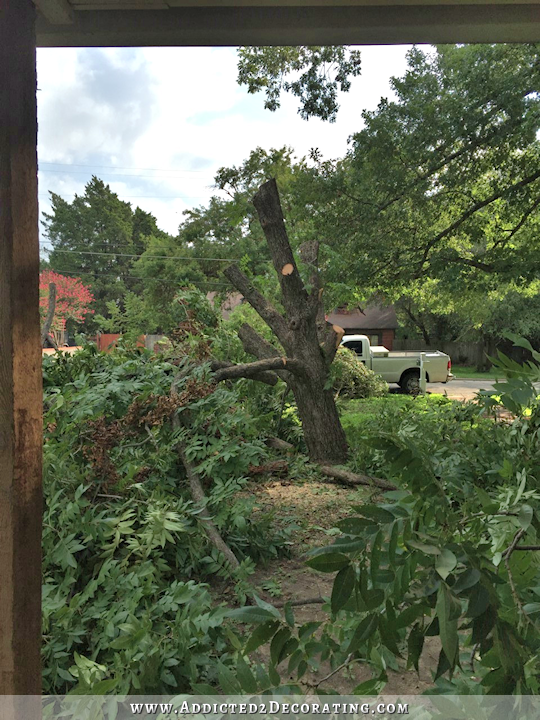 It cost $800 for us to have a large (dead) pecan tree cut down about ten years ago. That was the lowest of three bids. You got a bargain. Last winter my dad found a tree guy. He wanted $700. My italian dad talked him down to $450 of course Telling him how much work did he think he would get in winter!!!! Are Good Tree Guys not the most amazing thing in the world? When we took down our tree in front of our house (huge UGLY pine beast that loved to eat my lawn mower blades), it took all of 10 minutes for them to get it down and loaded on a truck. Love trees – I am a tree hugger – but sometimes the Tree Guy is the best! I get the waiting til the time and PRICE are right – doing that myself right now. My beloved magnolia next to my driveway has gone from beauty with annoying droppings, to sinister root queen, out to destroy my driveway from below. Just my personal quirky side showing, I think I would have flea marketed a few mannequins or holiday personality lawn ornaments (witches, scarecrows, Santa…) and positioned them as though they were pushing or pulling that darned thing down. Even in tree removal, you do inspire! Boy, your people are showing up in droves! Watch out for new pecans sprouting from the buried treasure squirrel plantings. It looks wonderful. So happy for you. What is growing by your breakfast room windows? I am wondering the same thing; it looks like it needs some attention, too. Since it’s not hard & you’re so busy, talk to your lawn guy. He ay do it for a few extra bucks. That’s the thing with estimates. Prices all over the place. Nice neighbor to bring you someone reasonable. Good idea because with loppers it will keep coming back and the root will keep getting deeper. Needs to be dug up. Where is pecan tree number 2 that still had pecans? Is it in the back yard? I don’t see it in your house pictures. Isn’t it amazing how the prices for tree removal can vary? I have had the same experience of wildly varying estimates. You were probably right to get that free work done now because maybe next month that guy would have been busy. Should say tree work. Auto spell checker doesn’t like trees. The pretty pecan is on the right side of the driveway (as you’re looking towards the house). It looks great! 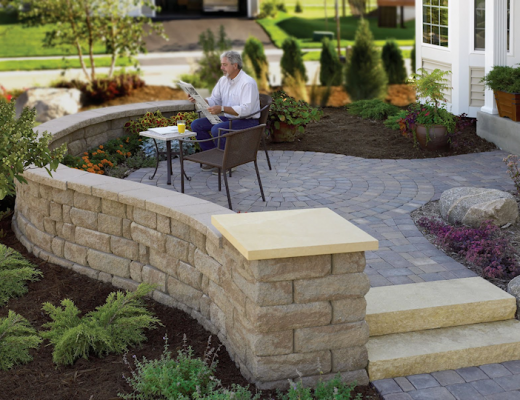 You will notice that your lawn will thicken up and grow better with some sunlight, as well. We’re in the process of deciding what kind of trees we want to put in our yard. We had to have 2 taken out this summer – 1 was diseased and the other lost more than half in a huge wind storm. We need fast growing shade trees as our yard has no shade left! Sue, you gotta be careful with fast growing trees for quick shade. My understanding is that the fast growing trees typically has weak limbs, so are prone to break during wind storms. Hope you find the right mix between strong and fast! There are good tree trimmers that know what they’re doing and trim to strengthen the tree’s natural shape and structure and there are hacks that top a tree ruining it’s shape and stability and create problems a few years later when the tops send out multiple sprouts. But when you find trimmers that know what they’re doing at a great price, hold onto their number! 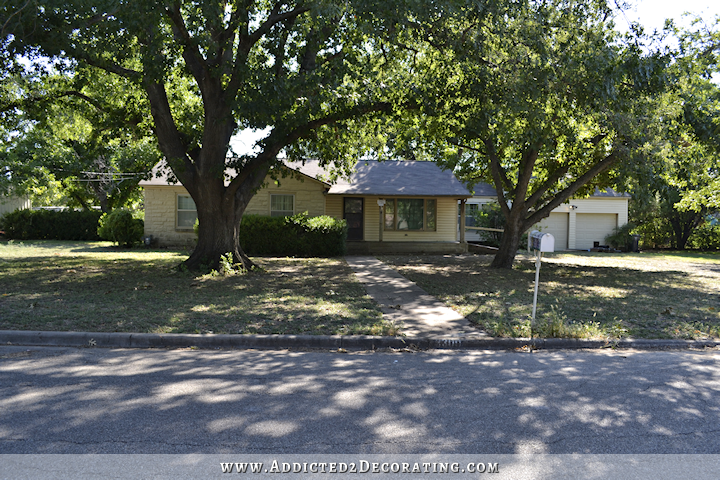 The poor old pecan had to go, and the yard looks better! Wow, your list of go-to guys for all kinds of jobs is growing. I understand your reluctance to take that first estimate. Tree trimming and removal can be very very expensive. It’s hard to spend that much to get what amounts to a negative – nothing there at all. Although the lawn will start to improve right away. Another inspiring improvement. You are on a roll now! Can’t wait to see what comes next! And pecans are so expensive at the store. I’d fight the squirrels for them! I love that it’s gone, but so happy you didn’t accept that first bid. Yep, that old tree had to go. The tree guy that quoted $1500 was way out of line. Last Fall my guy’s company sent out four men, a HUGE articulated arm “cherry picker” and a truck-mounted chipper. They removed three black walnuts overhanging the house, removed bad limbs on five more, and chipped up an enormous brush pile. Hauled off all debris. Took them five hours at a total cost of $1300. NW Arkansas. I envy your future pecan crop. You can hire a harvester who will arrive with a “shaker” and tarps when the crop is ready. They spread the tarps and then the motorized arm gently “vibrates” the tree trunk. Harvester takes half as payment. I will just throw this in for the heck of it…………….shaking the pecan tree might stimulate more growth and more delicious pecans. I say this because my step-daughter had a little magnolia tree in her front yard that had not grown much in years. When she was talking about removing it, her mother said all she needed to do was hit it with a bat. Next thing she knew her mother was out there beating the tree! You guessed it, that magnolia is huge now and very, very healthy. Don’t know why it worked, but it did!!! Girl, you better get those pecans before the squirrels do!Pecans are the best and you can get them for free! All of a sudden you have a village helping you with your house! Awesome! Definitely the right time to open up and let others help! Glad to hear people seem to be looking out for you. Your neighbor was a big help! 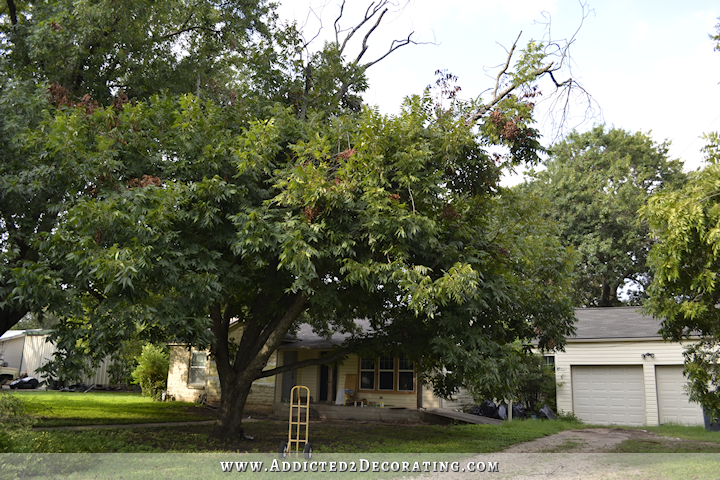 As for the pecan tree, I would love to have one! They are super expensive here in Mo., and I go thru a lot of pecans around the holidays! If they weren’t so pricey, I’d have them year round! Glad to see your experience worked out well. It’s so great to see difficult tasks completed in a day. Our tree experience wasn’t great, we got so many quotes. We had an ivy covered rotting cherry tree that was in a tight spot when we moved in, with other tree trimming needed around the yard. One guy walked out on a quote appointment after he realised I was a woman that wasn’t giving into his pressure (… to sign an agreement before consulting my husband). We did settle with a person with a reasonable price and the right mix of labor/expertise/insurance. (under $1000, 2 trees, + trimming an oak, previous experience of this scenario). We had bad luck to book before a bad storm, (it was a small, non emergency job to them). So, there were two reschedules, effectively waiting two more weeks, so we could supervise day-of between two full-time schedules.